But using a cool trick, you can add music to your iPod in the easiest way possible without being bogged down with iTunes. Start by plugging in your iPod. Make sure that iTunes is not running—if it opens automatically, simply close the program. Step 2: Access iPod Through "My Computer"
Open My Computer, either through an Explorer window or through the Start Menu. Now double-click on the iPod, then select Tools -> Folder Options. Go to the View tab, then check the option for "Show hidden files." You'll now see a folder call "ipod_control"—double-click to access it, and simply copy or drag and drop your mp3 files into it! That's it, now you have music on your iPod without ever having to use iTunes! hello.....when i plugged my ipod nano .....it says to format it...so i format it.but when i fomat it and sent some data it doesn't read ...then i found this site.... now i dont have the ipodcontrol folder because i had to format it?? ?what now? Well, I tried this on my ipod touch, and the folder that was supposed to show up didn't show up. Any idea why? I've been spending way too many hours trying to upload songs from CDs that I own to my ipod. I've tried about 5 downloads. ipodTrans didn't work. Sharepod would only let me go from my ipod to my computer and not the other way. Kiwigeek or something isn't available for download any more. Something else starting with the letter A worked, but was only available free for one week. ipod Trans didn't work at all. Mediamonkey seems to have been the only one out of five that has worked. That's cause he's not using Windows 10! Any suggestions? I just tried this myself on windows 10. It took a bit of figuring out, but instead of a tool button (which we don't have on win10), I went into the ipod folder then clicked on "View" panel at the top. 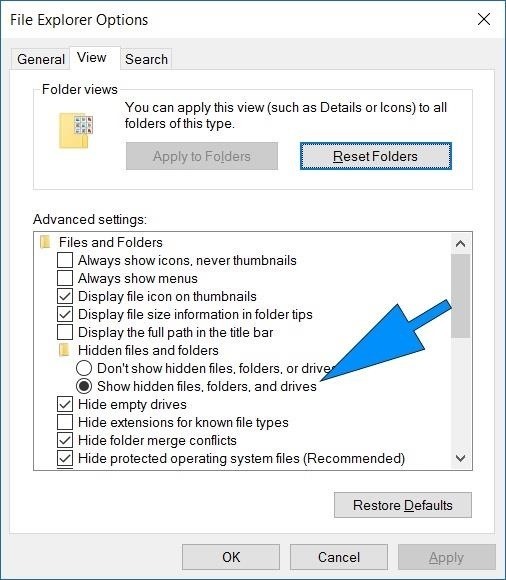 Then I clicked on "Options" at the end, selected "Change folder and search options", which took me to the "Folder Options" shown in the image on this page. Then I went to "view" - "show hidden files", and problem solved! iPod Nano 7th generation. I can make the folder appear and drop music into it but it won't show up on the device. Just wondering if anyone knows how to fix/make this work or if there's another site or forum on this site that can show me. Thank you. hey there, i did everything you said, step by step. but my music still isnt showing up on my ipod. why is this happening?